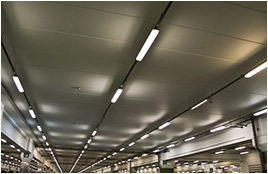 Most highbay lighting should either be T8, T5HO or LED. Retrofits are going to give you maximum efficiency, superior color rendering, and long lamp/ballast life. They are perfect for use in warehouses, factories, arenas, studios, gyms, supermarkets, and beyond. Call Progressive Energy Solutions to learn more about retroifitting your highbay lighting or if you have a new establishment that needs top-of-the line, cost-effictive high efficiency lighting. 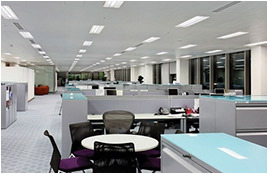 Many flourescent lights in the work place are considered brighter than they need to be by the IES illumination standard. This, of course, is not efficient and could be contributing to a higher energy bill. The process of delamping brings down the over-all brightness of a room to where it should be. In some cases, the brightness needs to be raised, as lack of brightness can be a safety concern. Progressive Energy Solutions will test the luminocity of your rooms for you and determine what steps need to be taken for optimal efficiency and safety. 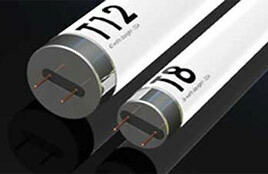 T12 and T8 refer to the diameter of lamp tubes. Thus, a T8 lamp has a diameter of eight eighths of an inch, or simply 1 inch. Typically, a narrower lamp is more energy-efficient. Since the T12 is twelve eighths of an inch, or 1.5 inches in diameter, it is a less energy-efficient lighting mechanism than the T8. T8 lamps are available a variety of lengths, and they also come in either straight or U-shaped lamps. Retrofitting from T12 to T8 is cost effective and easy to do, and if you can't afford to transition all your lights at once, just replace old bulbs as they burn out. 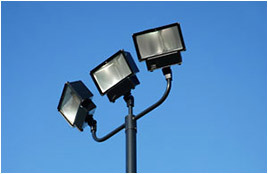 Exterior lighting can be a very expensive part of your overall facility appearance. Security and safety are greatly enhanced with the proper exterior lighting. New advances in lighting technology have made it possible to give better and more powerful light while at the same time reducing overall energy costs. Let Progressive Energy Solutions perform an energy audit to help you find the most efficient lighting for all your outside areas. Progressive Energy Solutions will provide options for new lighting fixtures or retrofitting existing fixtures at very affordable prices. Parking garage lighting greatly influences the perception of your facility in terms of security, safety and quality. Your visitors might perceive poor illiumination and old lighting fixtures as a reflection of your parking garage management. Parking garage lighting is one of the largest expenses that owners face. With lights burning up to 24 hours a day, seven days a week, the typical energy bills from lighting can be very substantial. Let Progressive Energy Solutions retrofit your current lighting with new energy efficient bulbs and fixtures. Retrofitting your lighting will provide numerous benefits to you. 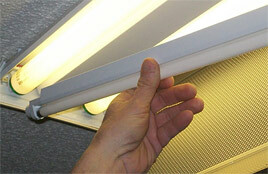 We can help you reduce your lighting energy bill by up to 60%. Also the newer lighting solutions reduce your need to replace the bulbs as frequently saving you time and maintenance costs. Parking garage owners across the country have realized dramatic energy savings by retrofitting their lighting to T5/T8 Fluorescents or LED lighting. Progressive Energy Solutions is not limited to one lighting solution. We represent hundreds of lighting manufacturers. Our large selection and volume purchasing allows us to provide you with the best selection at value pricing. We can also provide financing or help you qualify for exisiting state and federal energy tax deductions. Please call us today to start your lighting retrofit project and start saving energy! Your bottom line will be glad that you did. Improving your lighting systems is one of the first steps the EPA recommends to increase the efficiency of your buildings—whether you are retrofitting existing or designing new buildings. Lighting uses about 18 percent of the electricity generated in the U.S., and another 4 to 5 percent goes to remove the waste heat generated by those lights. With proper design, lighting energy usage in most buildings can be cut at least in half while maintaining or improving lighting quality. A Lighting Retrofit is an investment not only in reducing electricity consumption but also in improving the way a building supports its occupants. 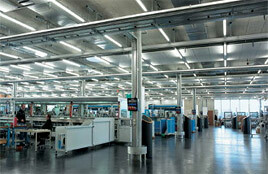 Progressive Energy Solutions can be a turn key partner for your Lighting Retrofit project. Whether your needs are exterior or interior lighting we can keep your project on budget and on time. We guarantee it. Please call your Progressive Energy Solutions consultant today!